In 1991 South Africa was the first country in the world to label the Great White Shark as a protected species and has since then been leading the world in trying to learn more about this remarkable ocean dwelling predator. Unfortunately for the Great White Shark the mass media and the popular press have never quite been able to drop, or have never been willing to drop, the stigma that the movie “Jaws” attached to this majestic beast. The Great White is not the only shark that is suffering, the shark fin industry is worth billions of dollars every year, between the years of 1996 to 2000 it estimated that between 26 and 73 million shark fins were traded. The huge discrepancy in these numbers stems from the fact that shark fin trading is a legal grey area with shark fisherman and suppliers exploiting legal loopholes and operating illegally in countries where enforcement structure is either underfunded or turns a blind eye. In order to have more space on the boat for the valuable fins, fishermen have taken to finning the sharks at sea and dumping the bodies overboard, often still alive. This barbaric practice has only helped to increase public outcry against the shark fin trade. Great white shark conservation is a top priority for the save our seas foundation in Cape Town and the many Cape Town shark cage diving operators. 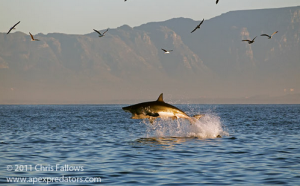 The 1970’s in South Africa experienced a similar phenomenon to that which it has been experiencing since the beginning of this century, Great white sharks are being portrayed in the media as man eaters. Increased media coverage of shark attacks does not necessarily mean there has been an increase in shark attacks. Between the years 2000 and 2010 there were a total of 41 shark attacks; of these 8 were fatal, that is less than one fatal shark attack a year off our coastline. Compare this with the amount of media coverage dedicated to Great white shark attacks and discussion surrounding how to combat this “scourge” of the sea and it’s easy to see why great white sharks have a bad reputation. As in the 70’s all sorts of theories are surfacing as to why the sharks are “suddenly” attacking people if history taught us anything it’s that we still have a lot to learn about the Great White shark. Cape Town shark cage diving operators are changing these popular misconceptions and are helping the on-going research into the Great White’s behaviour. By allowing the general public to get close to these feared beasts and educating them with what knowledge they have, the Cape Town shark cage diving operators are helping to spread the word across the world that these predators need our protection. It makes sense that Cape Town shark cage diving operators have a good understanding of the False Bay Great White Shark’s behaviour, it is their livelihood. Most, if not all, are passionate about the sea and sharks and many devote their free time to marine conservation projects. Logically though it makes good business sense for the Cape Town shark cage diving operators to want to conserve the natural habitat of the White Shark and to have a sound understanding of their movements as this will help them plan tours.Cape Town shark cage diving operators are working in partnership with local conservation organisations to ensure that a greater understanding of the sharks is achieved and to make sure that this amazing wildlife experience is preserved forever. This entry was posted in Uncategorized by synergize. Bookmark the permalink.